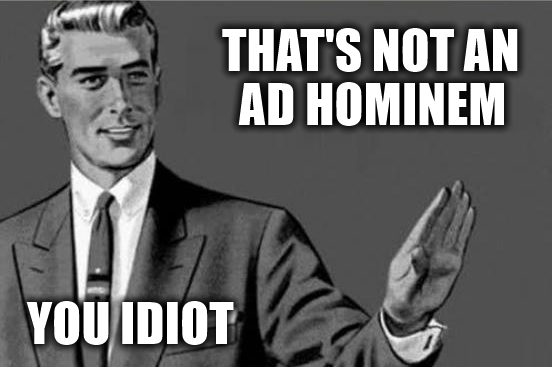 Ad hominem attacks on anyone who isn't willing to allow Illegal behaviors of any kind is the most powerful model in politics today. Character assassination, leading to all out calls for banishment has finally surfaced on college campuses. What we have is PC having a psychotic break. Progressives are now eating there own. the citizens of the world. Too many Mexicans, too many Muslims, and too many people from dysfunctional segments of the population disagreeing with facts and logic. Just ask yourself where all of the problems we are facing are originating. The most progressive States and Cities are literally crumbling under the weight of lies and poor management. What the left needs to understand, is that everyone isn't convinced with repetitive lies and policy failures. There are those who would like us to believe that this nation would be better off in their inexperienced hands, fumbling from one crisis to the next, and then lying to cover the truth. as stupid does. Rather than admitting poor judgment and process they call us names. The perfect example of this flawed narrative is Immigration. Do they realize that over 10% of Mexico's total population are now living in our nation illegally? Do they understand that cheap labor hurts US citizens by deflating wages. Can they possibly understand that a illegals commit more crimes per capita than native Americans. Illegals create housing shortages, less access to Health Care and Food Subsidies. breakers who disrespect our way of life. And that's where ad hominem lives, telling us we are not compassionate, or that we are a racist nation that perpetuates white privilege not willing to understand the driving force of our success was created by Non-Hispanic speaking whites. comprises good character, and a willingness to assimilate into the American Dream.